Welcome to Omnicore, digital commerce partner for brick and mortar retailers. We are the outsource online sales department for fashion distributors covering everything from webshop development to orders` packing & delivery. We build omnichannel solution to make online shopping for customer easier and more comfortable. ULTRASHOP is a multibrand e-shop of Ultragroup, official distributor of brands Levi`s, Guess, Baldinini, Lagerfeld, Superdry and Hugo Boss in Ukraine. Within first 9 months after relaunch of e-shop with Omnicore sales from site grew 10 times. The payback period for web development and marketing investments was 6 months. Online store and CRM system also fully implement bonus loyalty programm, stock and price update. MD group assembles more than 100 brick and mortar stores, including official Tommy Hilfiger, Diesel, G-Star RAW, Replay, Gant, Under Armour and Pepe Jeans chains in Ukraine. Being a flagman fashion retailer in casual the group owned quite an outdated e-store. The challenge of re-building business processes and UX/UI of the website was aimed to deliver propper shopping experience to the fans of world-known brands in Ukraine. Synergy of efforts in web-development and digital marketing showed and keep on showing growth both in sales and market share. 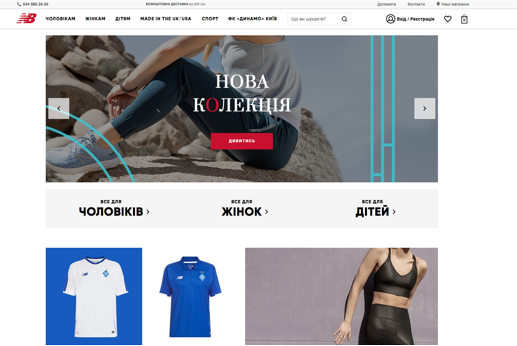 With the beginning of partnership with New Balance official distributor in Ukraine we were honored and challenged to represent world-famous sports brand online in the country. In design we combined brand`s principal elements and style with newest UX/UI solution and trends. The famous sneakers as well as other sportswear are presented via 360° image. The e-shop is being dynamically updated in response to business goals and brand`s development, e.g. shop-in-shop for Dynamo football team official kit, news feed and others. Via creating successful multibrand stores we have built strong expertise in presenting and promoting world best-known clothing, shoes and accessories brands. We know the do`s and dont`s of big brands` digital retail and will be glad to share our skills and knowledge with you.